Awarded an OBE in 1974 as recognition for a football career that included a World Cup win in 1966, Jack Charlton went on to gain even greater recognition across the Irish Sea. Having taken the Republic of Ireland to a World Cup quarter final in 1990, Charlton was awarded an Honorary Irish Citizenship, made a Freeman of the City of Dublin, given an honorary doctorate by Limerick University and had a life size statue made at Cork Airport in his image. 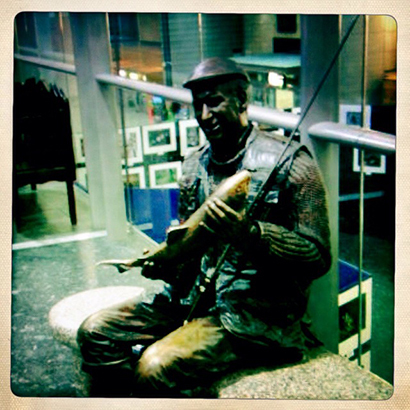 The statue depicts Jack in waders and a flat cap, a rod resting against his knee, and a salmon in his grasp. It is an image that sums Jack Charlton up rather well. Though his name is known for his football, it is on the riverbank that he is most happy. Charlton is a keen fly angler, and particularly loves the rivers of western Ireland, but he has turned his hand, and certainly his name, to other forms. He presented ‘Go Fishing with Jack Charlton’ (not to be confused with ‘Go Fishing’ (without Jack Charlton)) and in 1985 put his name to ‘Jack Charlton’s Match Fishing’, a state of the art computer game for the ZX Spectrum 48k. Fishpool doesn’t recall playing it, but the reviews he or she found online are not favourable….